These days if I want to do any geocaching that doesn’t involve solving convoluted puzzles I have to drive some way out of Gävle. Because of it’s geographical placing on the east coast that usually means driving in every direction but east. There are active cachers 40 km to the west but very few to the north and south. 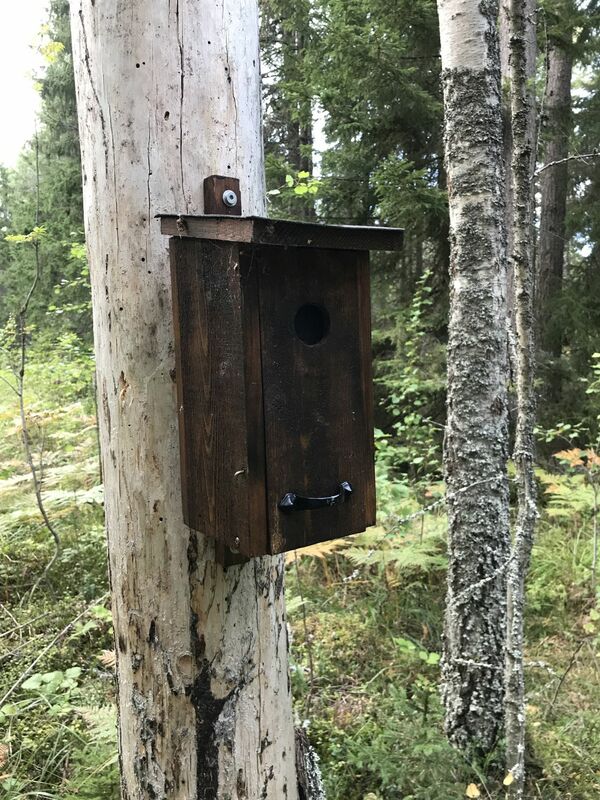 I decided for about the fourth time that I should do more caches in Uppland and was intending to do the RH-trail when I visited a friend who lives in the village of Näsmo half way between Fagerviken and Hållnäs. I stayed there so long that there was no time over for the trail. I only tried to find Hållnäs Kyrka but DNF’d it. Today my luck was better. I made a detour to Älvkarleby, Laxön to be more precise, as Carl XII bridge is being repaired and I wanted to see it as well as the photography exhibition on Laxön. That of course took time so I set off for Hållnäs later than initially planned. When I got there I went back to the same place I had searched before and after a couple of minutes I found the micro hidden in a very neat way in the signboard. Nice. From there I headed off for the RH-trail which runs on a wide gravel road between Fågelsundet and Hållnäs. There are 32 caches and of course I chose to do the trail in reverse order. At the first spot, a car was parked. Typical I thought, so had to drive to #31. As is always the case on a trail, I was expecting the CO to use similar containers and that the first one would give an indication of what to expect. This was an unusual type of container that I had only seen a couple of times earlier. I wasn’t to see many like on the trail either, as the containers were a mixture of small round tupperware type or birdboxes or micros. 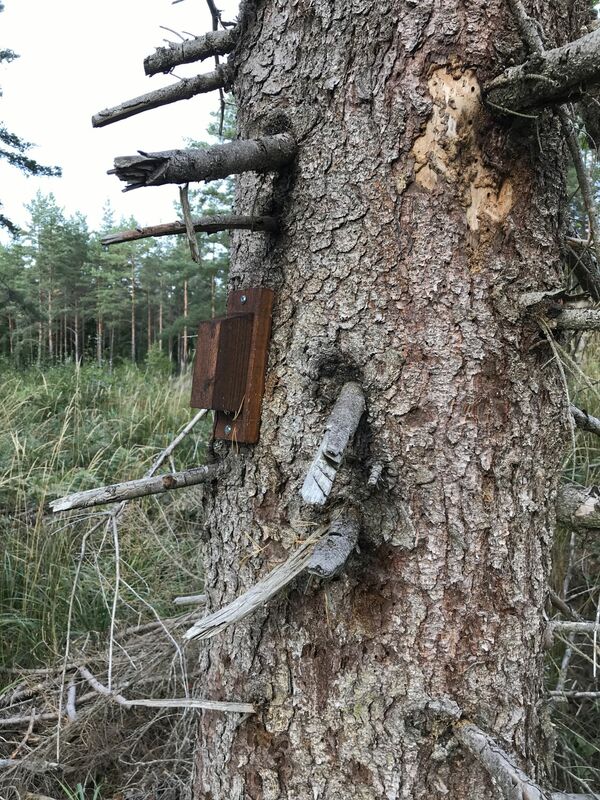 I love birdboxes as they are muggle invisible (obviously they can be seen but they are usually completely ignored by muggles. 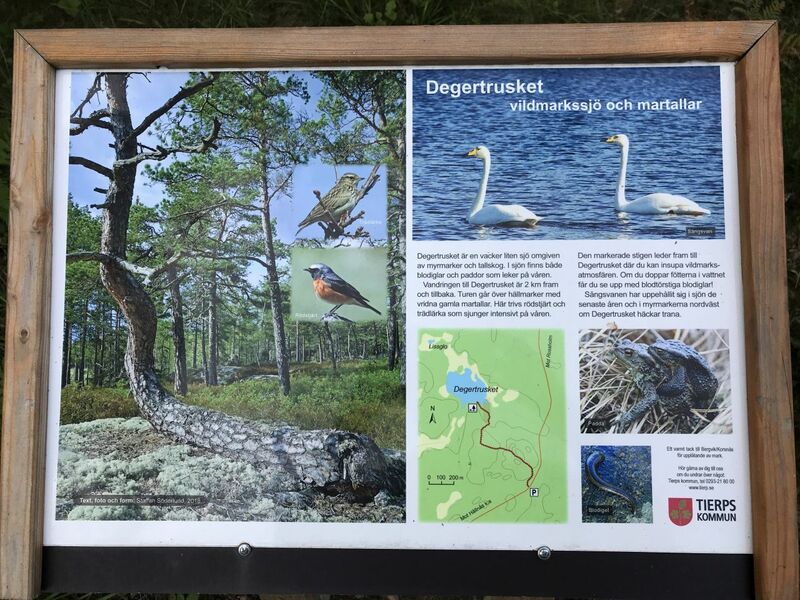 At #22 there was a sign pointing to Degertrusket an area that looked inviting. Obviously as I was on a mission, I didn’t have time for a detour like that so I will have to come back another time, preferably not in the moose hunting season. I found a couple more caches but got frustrated at #20. The hint was ”Inte två/Not two” meaning that I was looking for an ”En/Juniper”. The only problem was that there were dozens of them! I finally found the micro hanging in one of them. I guess it was within margin of error for my GPS but I decided to call it a day, but being curious I wanted to see the lookout tower that was market on my topo map as being just a few hundred meters further along the road. It was impossible to miss but wasn’t open to the public. However, as I had got out of the car I walked the 100 meters to the cache #12 before driving on to the asphalted road between Fågelsund and Hållnäs where I turned right and headed home. I’ll be back as it’s a pleasant area and I still have a couple of dozen caches to find there.